Columbia graduate student workers are on strike. What is the way forward? The Columbia grad workers have now joined the strike wave being led by educators across the country. Teachers, teachers assistants, food service workers, bus drivers and other school workers are rebelling against poverty wages and the chronic underfunding of public education. West Virginia school workers struck first, followed by Oklahoma educators, and today Arizona teachers are on the front lines. 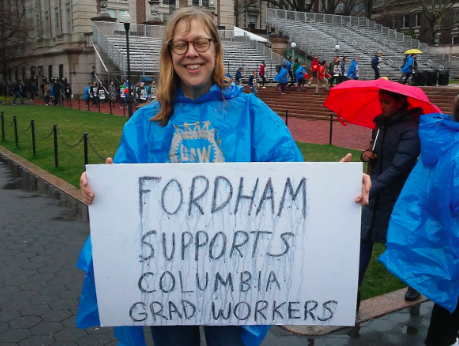 The Columbia grad student workers have spread what was until now a public ed strike wave to one of the richest private universities in the world. Columbia grad students have been joined on the picket line by faculty, undergraduates, fellow campus workers, and supporters from across the city. Members of SEIU 32BJ, the PSC, CWA local 4, the NYU-GSOC and other unions have spoken in solidarity at the daily rallies. Labor historian Eric Foner addressed the crowd Thursday, emphasizing the crucial role of unions in defending democracy. Frank Guridy, a faculty member specializing in urban history and social movements, spoke of the legacy of the 1968 student occupation of Columbia being reflected through today’s grad workers’ strike. A veteran faculty member recalled being on strike herself as a teaching assistant in 2005, and also connected the current struggle to major strikes currently being organized by French rail workers. 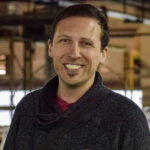 At the same time, the strike’s impact is severely limited by a number of factors that, if not changed, will allow the administration to ride things out for the indefinite future. 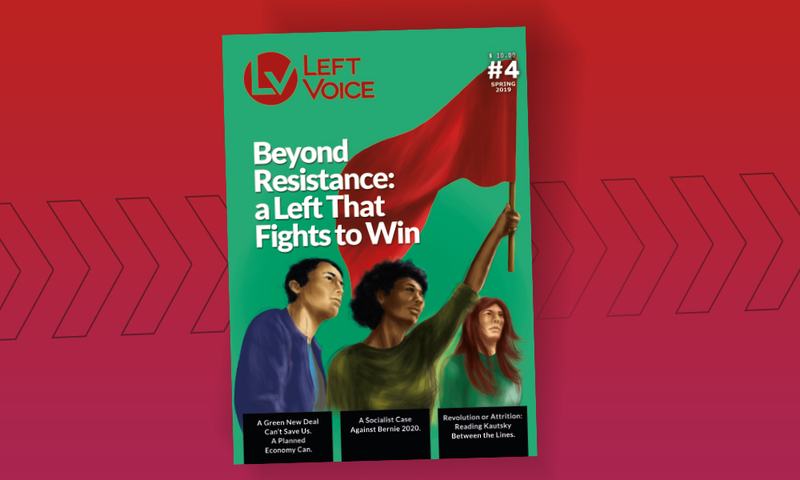 On one level, the striking graduate workers face the uphill challenge of building solidarity between departments and getting everyone to actively participate in the strike. In some sense, the decision to limit the strike to one week is an attempt to get maximum participation from student workers who are reluctant to walk out for longer. The strike is also limited by the fact that grad workers are the only ones striking — the rest of the faculty (tenured and contingent) remain unorganized, and have not been asked to strike. Only classes exclusively taught by grad workers are canceled, not ones taught by adjuncts, lecturers, or tenured faculty. 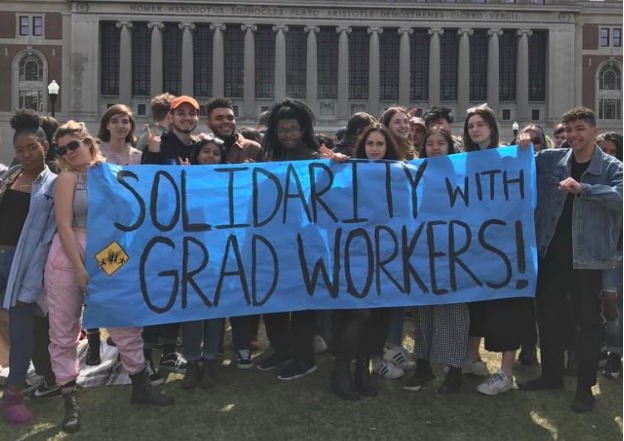 The limited character of the current struggle must be understood as a weakness to be urgently overcome if the grad students’ union, GCW-UAW local 2110, is to build a bastion of worker power at Columbia and not be marginalized. 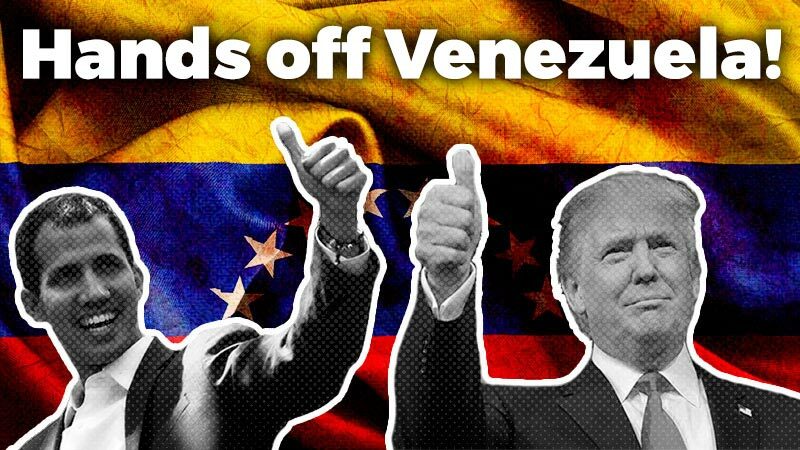 Extend and Broaden the Strike — Shut Down Columbia! That a large number of grad workers recognize the inadequacy of a week-long strike and are fighting to extend it through final exams — a time when a grad strike could really cause some problems for the administration — is a positive step. The power of the West Virginia teachers, mentioned in the Columbia petition, derived from their solidarity, community support, militancy, and crucially, their ability to shut down the schools. Regardless of whether the current walk out continues through final exams, the conflict will not be resolved this spring. Indeed the Graduate Student Organizing Committee has framed its struggle in class terms, pitting academic workers against the millionaire president of Columbia, Lee Bollinger, and the billionaire investors that the administration serves. Picket signs and chants often emphasize that TAs and RAs are part of the broader working class, a rejection of Columbia’s elitism. So long as the university is owned and operated by a wealthy elite, class conflict will remain. Strikers have revived an important slogan long forgotten by many unions today, chanting “picket lines mean don’t cross!” This union tradition, the idea that workers should respect (not cross) picket lines, points in the right direction. If picket lines are present at crucial buildings and entrances, and if other workers and faculty refuse to cross, the power of the strike will be greatly magnified. 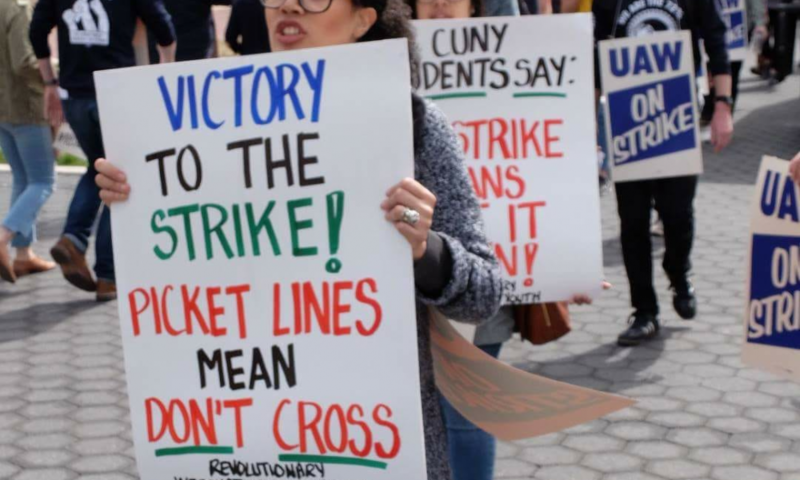 While grad workers are petitioning to extend the strike, other campus workers could also be putting their name on record that they will, at the very least, not cross any picket lines. By making a broad appeal to every faculty member to cancel classes in solidarity until Columbia agrees to bargain, the strike could gain strength and emerge victorious. Workers have the power to “Shut it down!” but we need to use that power. 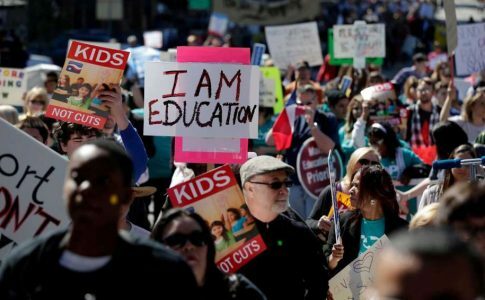 After decades of retreat by organized labor, teachers — along with teachers assistants, food service workers, bus drivers and other school workers — are rebelling against poverty wages and the chronic underfunding of public education. West Virginia school workers struck first, followed by Oklahoma educators, and today Arizona teachers are on the front lines. The Columbia grad student workers have spread what was until now a public ed strike-wave to one of the richest private universities in the world. The grad student strike at Columbia will also impact the thinking of university workers across the country who may themselves strike. Boston College and Harvard University grad workers recently also won union elections, and workers at the University of California, as well as the City University of New York, have authorized strike action. The outcome of the Columbia struggle will set an important tone for others. Columbia University epitomizes the vast, ever-present social chasm that is New York City: extreme affluence, coupled with inequality, poverty pay, and racism. The Black and Latino population in Harlem and Morningside Heights, populations facing police violence and unaffordable housing costs, have no love for Columbia, a school that is only accessible to a small number of working-class students and students of color, and is resented as an elitist, gentrifying institution. Columbia has vast material and intellectual resources, including many esteemed research and teaching programs and rigorous, valuable opportunities for higher learning. But these resources and opportunities are owned by the millionaires and billionaires that call the shots. For them, Columbia exists to perpetuate the profits, legacy, and reproduction of the 1%. President Bollinger and the rest of the administration don’t want Columbia to serve everyday working people. The extreme hostility evinced by the administration toward campus unions is but one part of its general disregard. Speakers at the daily strike rallies have brought Columbia’s dark underside to light: 12 CU students committed suicide in the last year alone and the administration continually neglects reports of harassment and sexual assault. 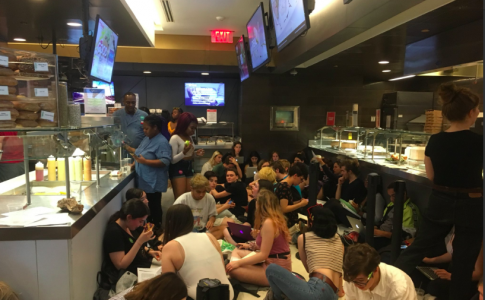 A member of student group 24/7 Columbia, remarked that the administration, despite its billions of dollars in assets, refuses to invest resources to help students struggling with mental health issues, students facing sexual assault, or simply students who need emergency medical services after 5pm. Seize the University for the Working Class! 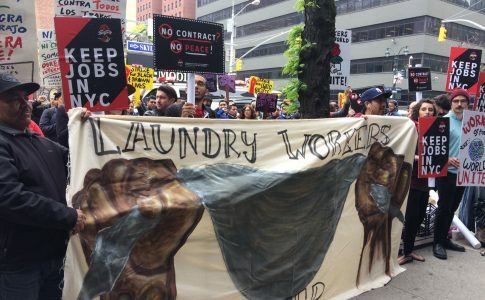 Building worker power on campus through unions can create space and confidence to fight for bigger goals, like free universal higher education, the construction of affordable housing, and the cancellation of student loan debt. However, even if the entire campus were unionized and every worker had a decent contract — a tremendous goal in itself — the purpose of the university would still be decided by wealthy investors, donors, and an un-elected administration. To truly shift the paradigm of what Columbia stands for, students, workers and faculty will need to one day seize the university and rip it out of the clutches of the billionaires. Workers keep the school running, and students pay millions to attend the university, yet neither workers nor students have any real say over the school’s mission and policies. The landlords and union-busters that rule Columbia today should be stripped of their assets, and the vast resources of the university taken into public ownership. Just as Black and Puerto Rican students had to militantly occupy the City University of New York to end the school’s de facto exclusion of students based on race, so to must Columbia’s workers and students open up the university to the broader working class. Institutions of higher education should be run by elected, accountable leaders, by committees of workers, students, faculty, and the surrounding communities. 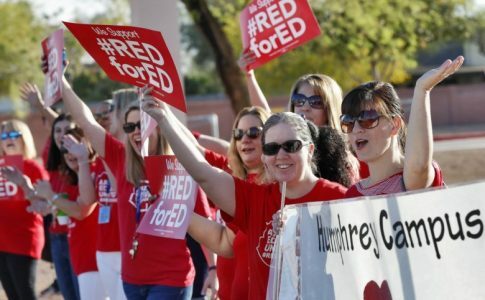 Left Voice interviews an Arizona teacher on their walkout, which begins on Thursday.